Tenth seed Feliciano Lopez recorded his first Top 10 victory in 11 months for a place in the Aegon Championships semi-finals. 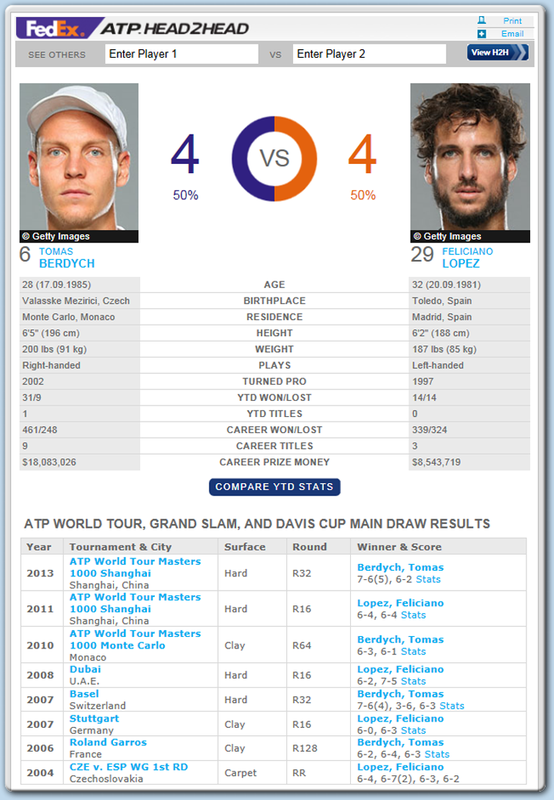 Lopez hit 13 aces to beat Tomas Berdych, the No. 6 in the Emirates ATP Rankings, 6-4, 7-6(7) on Friday afternoon. He recovered from a 3-6 and 6-7 deficit in the tie-break. It was Lopez’s 50th match win on a grass-court and propels him into The Queen’s Club semi-finals for the first time in four years (l. to Fish) and into his first ATP World Tour semi-finals since 2013 Gstaad (l. to Haase). Lopez goes on to face another Czech, Radek Stepanek, the No. 15 seed, who reached the semi-finals for the first time in nine years with a 1-6, 6-3, 6-2 win over seventh seed Kevin Anderson, who struck 15 aces. Stepanek lost to Andy Roddick in the 2005 semi-finals.